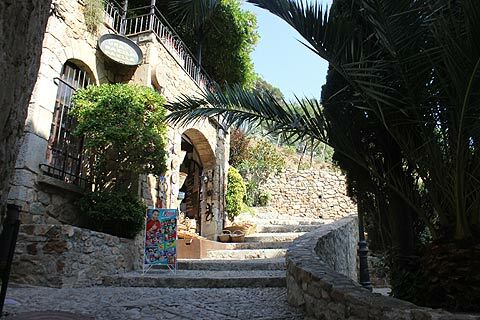 Tossa de Mar is in the province of Girona in Spain's Catalonia region. 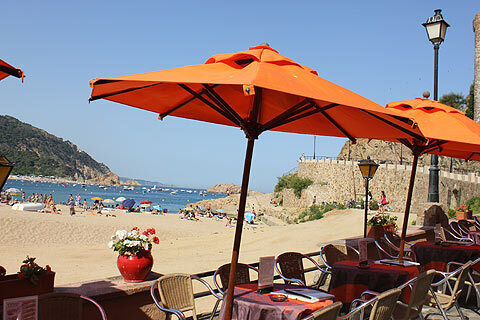 It is a fabulous town on the Costa Brava coast. 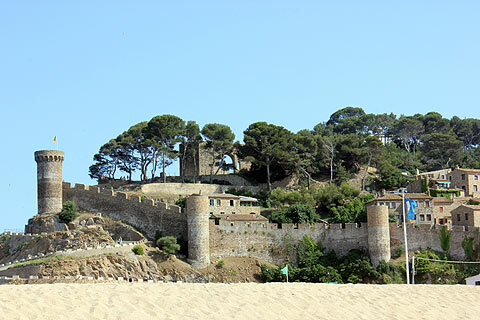 Tossa de Mar's beach is dominated by the medieval old town and huge ramparts looming over the beach at one end and the medieval streets that lie below it. 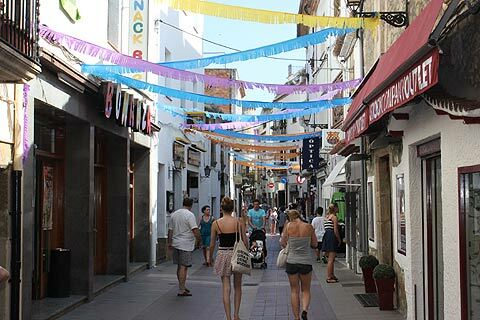 Walk along the narrow streets running parallel to the beach and you enter a maize of lovely shaded streets full of whitewashed buildings housing lovely restaurants and some quite chic shops as well as those designed for tourists. The streets are packed with holiday-makers but retain their charm and offer a welcome respite from the heat of the beach. 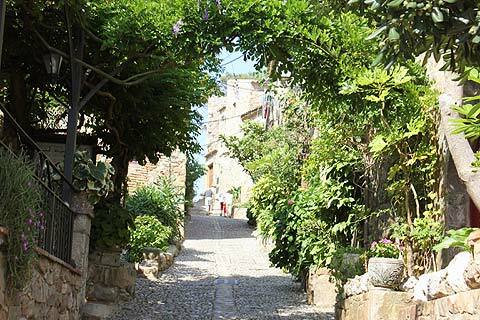 Continue through the streets towards the fortified old town and the architecture changes. Cobbled streets lead you uphill past beautiful stone, medieval houses also home to shops and restaurants thought this part of town is distinctly less packed. This old part of town is called the Vila Vella (old town) and if you do one of the boat trips from Tossa de Mar you get some lovely views of the Vila Vella from the water. It is dominated by its huge medieval walls and three sturdy turrets. At the top of the Villa Vela you get some great view of the coast to the north and south of Tossa de Mar. It is possible to walk on parts of the ramparts. 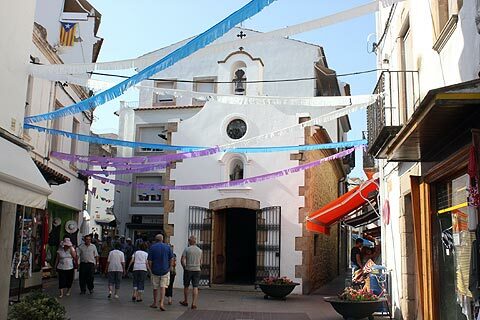 Within the Vila Vella there is a 14th century church and at the top is a lighthouse. There is also a statue of Ava Gardner because of the fame she brought to the town with her 1950 film 'Pandora and the Flying Dutchman'. There is also a museum - the Museu de la Vila Vella which has a Roman mosaic and items from a nearby Roman villa. 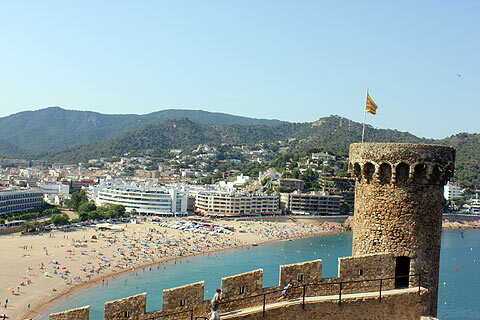 Tossa de Mar has four beaches. The main beach in the town is sandy, though the sand is gritty, and busy. Around the headland is the Mar Menuda which is quiter and very pretty. It is a popular spot with divers. To the north and the south are small coves which are very nice but you need to drive to them. Tossa de Mar is close to the bigger resort of Lloret de Mar and you can get to Lloret by bus or boat if you do not want to drive. Lloret de Mar has a very lively night scene.